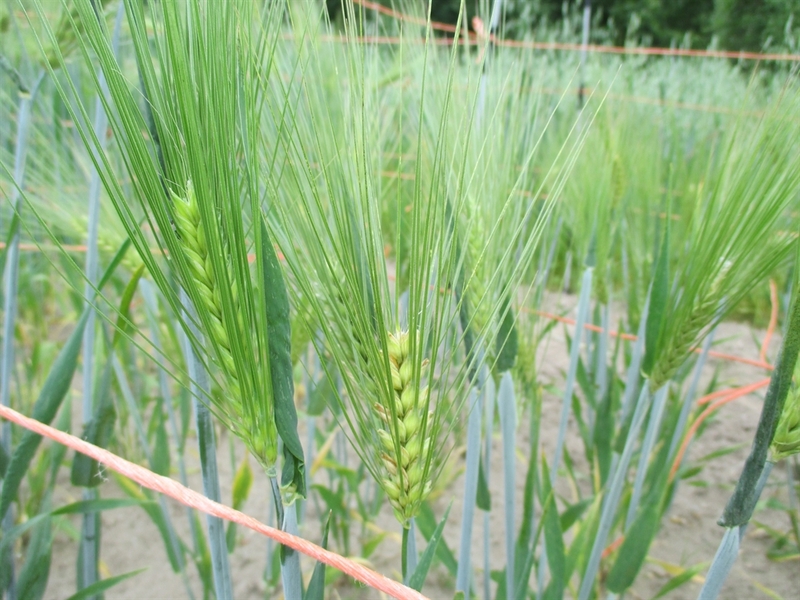 This last season I trialed out a number of spring-planted wheat and barley varieties. 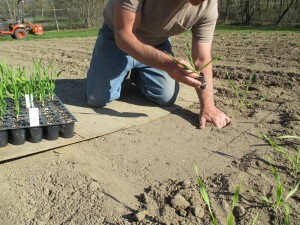 I want to compliment my existing winter wheat varieties with one or two spring-planted varieties. The logic being, if you lose the winter crop, you still have a spring crop for summer harvest. 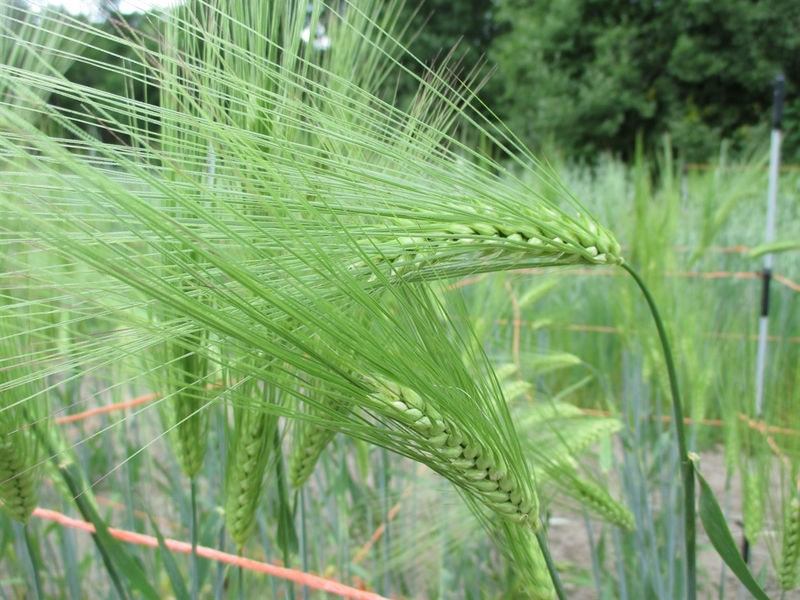 For the barley, I want to identify hulless varieties that perform well here in my region. 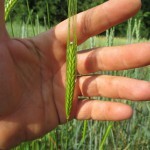 There are fall-planted barley varieties, but they are generally not hulless types, and therefore less suitable for human consumption. I am not talking about barley for brewing. Malting is accomplished with grain that still has its hulls intact. My interest is in barley for cooking and milling into flour. I tried two fall-planted varieties in 2013, Schrene and Purple Hulless. Neither survived the bitter cold of last winter. I have settled on raising spring-planted barley for the foreseeable future. I could not have picked a worse year for trialing cereal grains here in the Midwest than that of 2014. 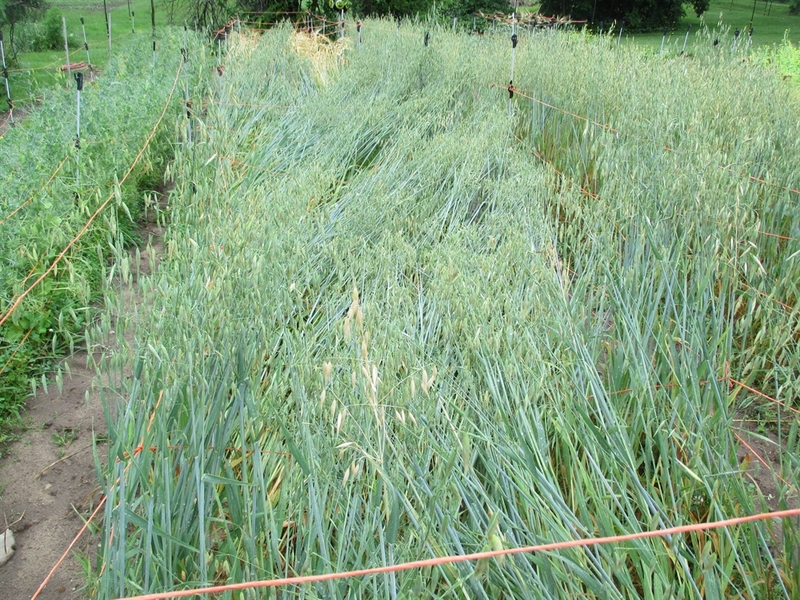 Not only did my fall-planted grains have to suffer through one of the coldest winters on record, but they and their spring-planted cousins had to then endure one of the wettest spring/summers I have ever experienced. Keep in mind, my farm is not well-drained. There are very few level spots on the property and my soils range from heavy clay to clay loam. If that is not bad enough, the area where I have my beds is a low spot, so all rains and snow melt in the neighboring area eventually migrates through my fields. I thank God that I have no conventional farming neighbors. Our property is surrounded by mostly woods and a few neighbors who do not practice the art of ChemLawn. This crop would be flattened from lodging without supports. field, repairing damage to lodged crops would be nearly impossible, although, lodged plants sometimes correct themselves. On the flip side, an advantage small-scale grain growers have is the ability to shore up plantings in anticipation of bad weather, via staking beds with supporting horizontal trellis or twine. If you want a visual for the physical and emotional damage lodging can produce on a large field of grain, Youtube little House on the Prairie, season one, episode 2. Here is a brief summary of my trials. I do not have yield data, as the plantings were small. Most of the seed came from The KUSA Seed Society. The rare varieties came in packets of approximately 50 seed each. I handle these small quantities by starting the plants indoors and then transplanting into the beds a couple weeks later. Larger amounts I plant by direct seeding in rows or by broadcasting. Planting was done in April. Remember, I am not assessing the overall value or importance of these particular varieties, but only recording how they performed for me here in Northern Indiana. GLOBE WHEAT STRAIN 1506 Very poor formation of grain. Small and misshapen kernels. Not planning to grow again. SIN EL PHEEL A landrace variety from ancient Iraq. Poor kernel formation. A fair amount of observable fusarium disease present (pinkish discoloration on outside of husks or present on grain kernels) Not planning to grow again. SPRING DINKEL WHEAT I currently raise Winter Dinkel which performs much better than the spring varietal. Both are spelt and extremely difficult to dehull. Not planning to grow again. Wheat”. It fared much better than all the other spring planted varieties. It flowered later and my harvest was not until the 10th of August. The grain quality was fairly good. I noticed a few “mummies”, ( a term used to describe small misshapen grains, also referred to as “tombstones” for their distinct shape) these can be removed by using a fanning mill or gravity table. Einkorn has a hull that is difficult to remove without special equipment. I will be growing this again. I have a limited quantity of this seed available. GOLDEN EMMER WHEAT Another ancient wheat, found to have been cultivated in Turkey. Easier to dehull than spelt or Einkorn. It produces large kernels and is excellent for making bread. This one performed fairly well. I noticed a small amount of fusarium on the outer hulls at harvest time. The majority of the grain kernels were filled out, but there was a number of small misshapen kernels. I will probably try this again in the near future. One special note, aside from these spring varieties, I also grew out three winter wheat varieties. Hard Red, Soft Red and Banatka. The Hard Red partially succumbed to “winter kill”. About ½ survived and I kept this seed for future trials. The Soft Red did great, the only problem is this type of wheat does not make good bread. The Banatka did great as well. It is a superior variety for bread making. I have the Banatka wheat and the Soft Red Winter wheat seed available. TIBETAN HULLESS BARLEY This 6 row variety was direct seeded in rows in early April. It performed well in wet soil and had a good resistance to lodging. 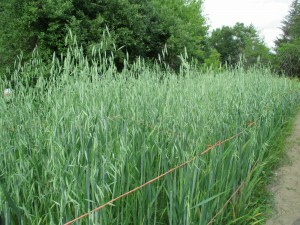 The stalks reach a height of 2 ½’ – 3′. The large seed heads were easy to thresh. The grain was of good quality but there were many tombstones, which really reduced the overall yield. 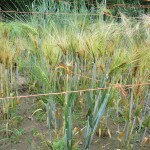 I will be trialing this variety again in the future..
ETHIOPIAN HULLESS BARLEY This is a 2 row variety. The plants tillered vigorously and produced a lot more biomass than the Tibetan Barley. The grains were very difficult to hull and there was a large number of tombstones. This variety was very susceptible to lodging. I will not be trying this variety again. GOPAL BARLEY This is a 2 row variety from India. It is a “naked” or hulless variety. This was the best of all the trials. The glumes and grains are purple when mature. Dark colored vegetables and grains are generally rich in anthocyanic compounds! Gopal is not as early as the other barley varieties I trialed. Most were harvested at the beginning of July. The Gopal was harvested the third week of July. I do not have seed available this season, but I plan on growing out all my stock this coming spring. I should have it available for 2016. MASAN NAKED 1 This is a six row barley from Japan. The grains are blackish-purple and easy to dehull. The plant produces many tillers (side shoots). Very strong stems and somewhat resists lodging. The harvested grain was of good quality with only a small amount of tombstones. Definite keeper! I have a limited quantity of seed available. glutinous-trait variety which is very rare in food barleys. The kernels contain the nutritious amylopectin starch. The grains are purplish in color. This variety did well and is easily threshed and dehulled. I noticed very few off-type kernels, including tombstones. I did not detect the presence of any observable fusarium. I plan to continue growing this variety. I have a limited quantity of seed available. WASE SHU BARLEY This is a six row variety from Korea. The variety had good growth but the harvested grain was small and contained a large number of tombstones. I will not be raising this again. 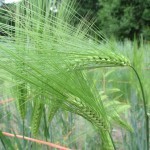 The following three are from a collection of barley strains or “karans” collectively referred to as “Miracle Seeds”. These strains were developed in India using traditional plant breeding techniques. The goal was to produce varieties that are very nutritious, drought and lodge-tolerant( with strong, stiff stems), and able to grow well on poor soils. Mysteriously, the project was stopped and the resulting karans were destroyed. The story has it, that some of the seed was rescued, 5 strains in all. The following are three of those original 5 surviving strains. I plan to trial the remaining 2 in the near future. one to be the most difficult to dehull of the three “Miracle Seed” varieties. The kernel protein is reported to be 16%. Also reported to be successful with limited inputs and limited irrigation. I detected a tiny amount of visible fusarium. There were also a small number of misshapen and tombstone kernels present. I plan to grow out this variety again in the near future given it’s high protein content. I have a limited quantity of seed available. KARAN-16 This six row variety is extremely “dwarf” in stature, reaching a height of 12 – 14 inches. I found it to be a little earlier than the other two karans. Possible to reach maturity in less than 80 days. Reported to have 12.5% kernel protein. Performs well with very limited inputs. The harvested grain had a very small amount of misshapen kernels and tombstones. I will be growing this variety again. KARAN-19 This six row variety is the tallest of the three karans, reaching 30 inches in height. The KUSA data suggested that it matures in 115-119 days. I harvested my grain in a much shorter period of time, about 90 days. This could be accounted for by the stress put on the plants by the excessive moisture. This variety is reported to have 14% kernel protein. Also reported to able to grow successfully without irrigation and very limited inputs. 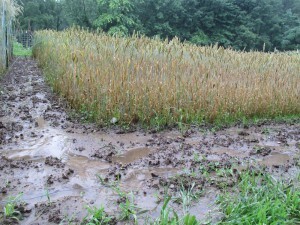 The harvested grain had few problems. I will be growing this again in the future. I have a limited quantity of seed available. One additional crop I tried this last season was spring planted Hulless Oats. These preformed very well, and I finally can make my own, freshly flaked, oatmeal! I have the Hulless Oat seed available on the website. Folks get excited about various, subjective interests. I get excited about growing new crops, especially new staple crops like grains. It was a rough year growing and harvesting cereal grains. 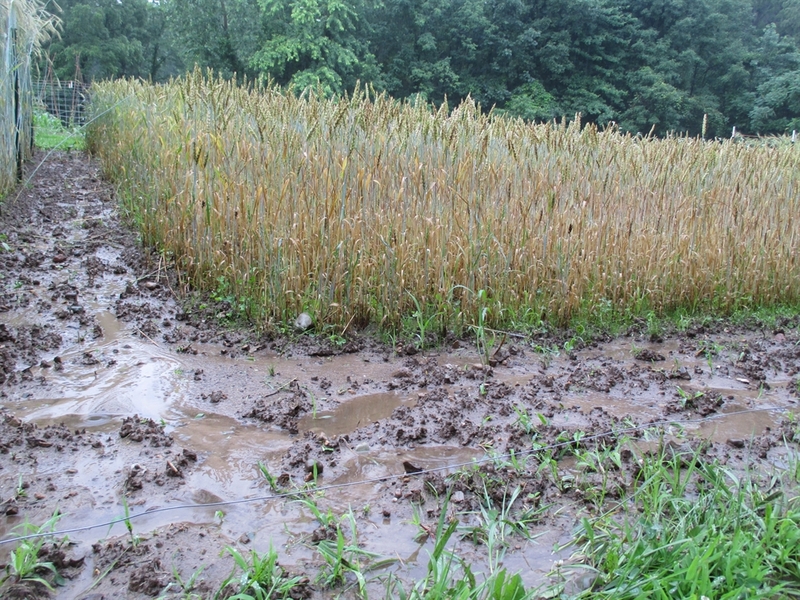 At certain points I felt like giving up altogether on wheat and barley, especially when I was harvesting my wheat by hand, wearing rubber boots in about an inch of standing water. But that is all past and I now have a better perspective on the small scale raising of these crops. I do believe it is well worth the effort. Hopefully, after another year of trialing other new strains, I will be able to recommend a handfull of proven varieties for our region. Then the yearly, ongoing process of selection, adaptation and regionalization can begin. This entry was posted in Grains, Methods, Uncategorized and tagged Ancient Wheat, calorie crops, Carbon Crops, Cereal Grains, GRAINS, Growing In The North, Heritage Barley, Northern Indiana Seed, regionalization, selection, Small Scale Production, Staple Crops. Bookmark the permalink. I am wondering what kind of farm equipment you use for your small scale farming projects. quinoa and amaranth, I start in my greenhouse in plug trays. These then are planted by hand into beds. rows and beds. Irrigation, if necessary, is accomplished with a RainBird sprinkler tower. teff, quinoa and amaranth are threshed by hand (literally) over a tub. Winnowing is accomplished by using a small fan. for eliminating sand and dirt from any crop, including dry beans. to make these crops ready for consumption. I had a small, hand crank rice dehuller built for me. It works great. off the shelf parts so there is very little fabrication required. equipment that I have found helpful. I’m doing a few trials with some of the Kusa varieties you mentioned in this post, albeit on a smaller scale. It will be interesting to compare notes since our weather here in Northern California is so much different (and very strange as of late). I’m curious what you do when you’re preparing to transition a planting area from grain cultivation to vegetable cultivation. After you harvest spring grains, to what extent do you need to enrich the soil for cultivation of vegetables and what sorts of fertilizers do you use? 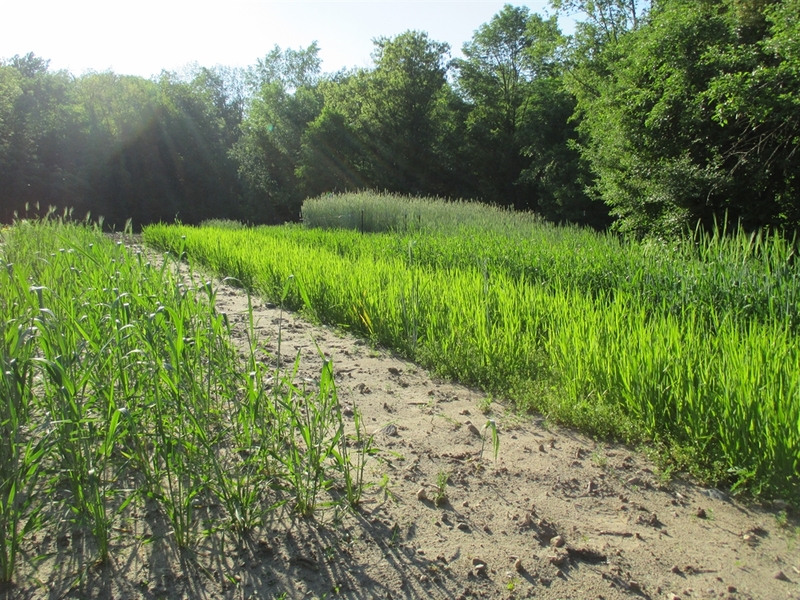 I currently have a stand of fall planted Rye and Iraqi Durum Wheat that will be ready to harvest in the spring after which I plan to grow dry beans and potatoes, respectively. Any pointers would be much appreciated. In regards to transitioning from grain to vegetables, I try to follow a 4 year rotation. I believe 3 year is fine, but for crops like tomatoes and cereal grains (both, I have found to be very susceptible to disease in my region with wet springs and summers) I try to stick to the 4 year. Once a crop is finished, I plant buckwheat. Even late in the season, buckwheat seems to get established quickly. It will self sow but it is a nice weed to have sprouting up. It is great as a soil cover over winter. I can not double crop dry beans after fall planted wheat in my region. Quick growing veggies like lettuce, spinach, turnips, etc. would work here. I usually do not have the time fall crops, so I pretty much rely on the buckwheat. I am anxious to try this Indian Multi-cropping system. This may change how I grow certain crops in the future. I have been using less fertilizer since I started growing the grains and beans. I have always used Fertrell. It is a great product, but not locally sourced. I want to eliminate all inputs if I can. Of course, I make lots of compost but there is never enough. Adding legumes and grains into the rotation is helping me to keep my soil health and fertility in check. How late in the year can buckwheat be planted? (~60 miles south of Chicago). For seed production start no later than the beginning of August. For use as a cover crop you can plant at the beginning of September. If fusarium head blight is caused mainly from rains during the flowering stage, would it help to find later maturing wheat varieties that would flower in August when it is usually dryer? 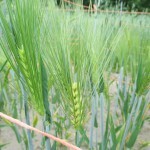 Or, because barley is a short maturing crop, could you plant it in mid-June so it would flower during dryer weather? I planted Frassinetto and Plainsman V wheat (both from sustainable seed company) in central Indiana last fall. They both flowered in late May to early June this year when it was extremely wet. The Frassinetto wheat seeds look to have a large amount of pinkish seeds, even though there weren’t many mummies. I suspect fusarium in these. The Plainsman V fared much better. One more thing. Where do you have your grains tested for DON and is it really that harmful if ingested in a few pieces of bread, for example? Thanks. I love your blog, by the way. oats. Planting in summer would likely mean no seed production. 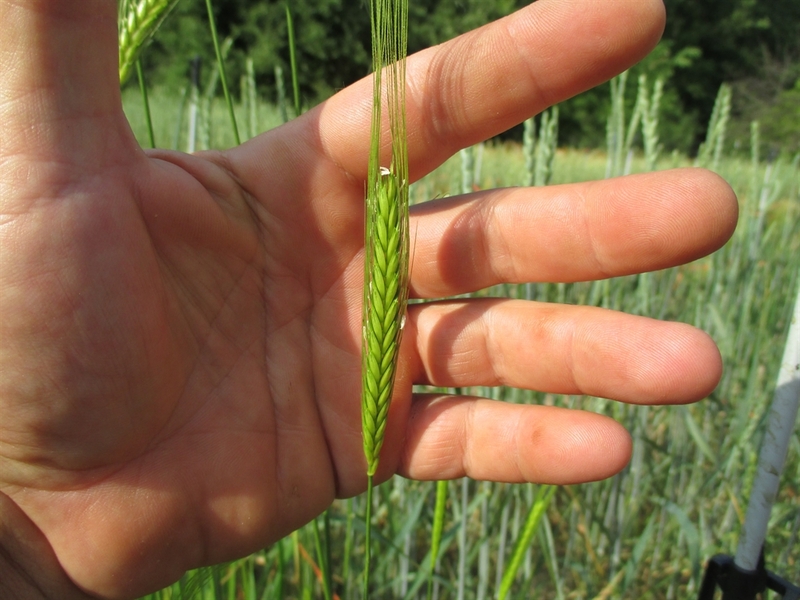 ancient landrace wheat called Black Zanduri. 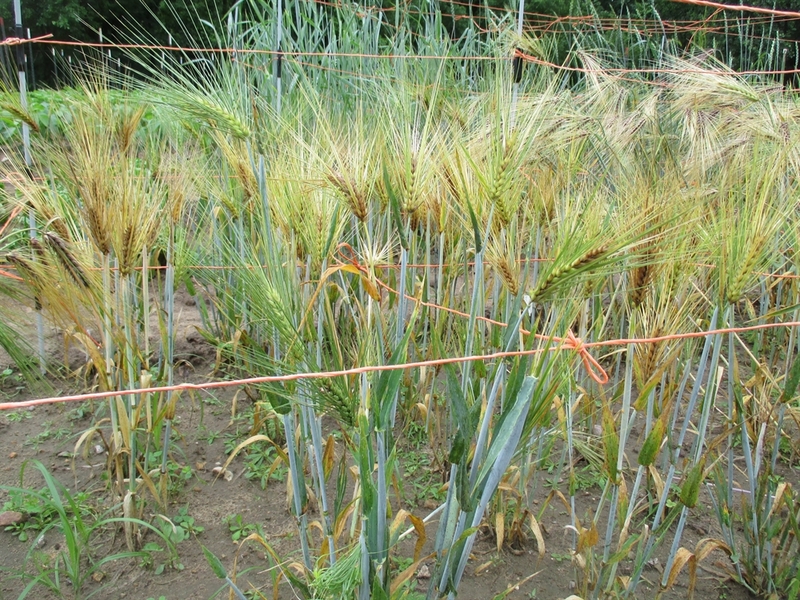 It is supposedly fusarium resistant. Einkorn on a small scale. $5.80 per test. It only gives a reading of +- 1ppm. Hi Sean, I’m wondering if Frassinetto is a hard white, hard red, or soft white? I can’t seem to find a definitive answer anywhere. Do you know? Where might I get an ancient variety of barley? I want it to cook and eat, not to plant, though I could sprout them and eat the sprouts too. I have asked about them on other sites, and the response I get is, “Do a Google search.” Well it is a wild goose chase. There may be a site that simply gets missed because it is on page 99. Any ideas ? Hello Robert, The only heritage barley I see available anywhere is the purple (both hulled and hulless). No actual varietal name is given so I can not say if it a true heritage variety like “Gopal” or “Sumire Mochi”. My best guess is that these may be improved cultivars. Sadly, I do not know of any sources for whole berries of any of the other multitude of heritage and ancient barley varieties. I have reached out to a friend who sells milling equipment for household use. He has traveled all across the US and abroad working with small bakeries, etc. If he gets back with ant information I will post it here as a reply. What is this milling equipment that your friend sells? Are you referring to the dehuller? That came from Brill Engineering. Thanks. Look forward to hearing more. Isn’t the Bere barley ancient? Heirloom, Heritage and ancient are three loosely defined terms. In my mind, Bere would be borderline Heritage/Ancient. If it truly dates back to the time of the Vikings, then that would place it some time between 750 AD and 1050 AD. When I think of truly ancient grains I think of Einkorn wheat (6000 years or older) and Hourani and Jaljuli wheat (2000 year old cultivars). Iam curious if this project of yours is still active? I work for a craft malt house and we work with heritage grains in addition to more prolific genetically refined varietals. I would be interested in talking more via email if you are still pursuing this project! Yes I am still working with heritage and ancient grains. I am currently trialing 40 new varieties this spring plus working with many that I have been raising the past few seasons.